June 2013 is a deep coral-red holographic with pink shimmer. All nails are 2 coats with top coat. 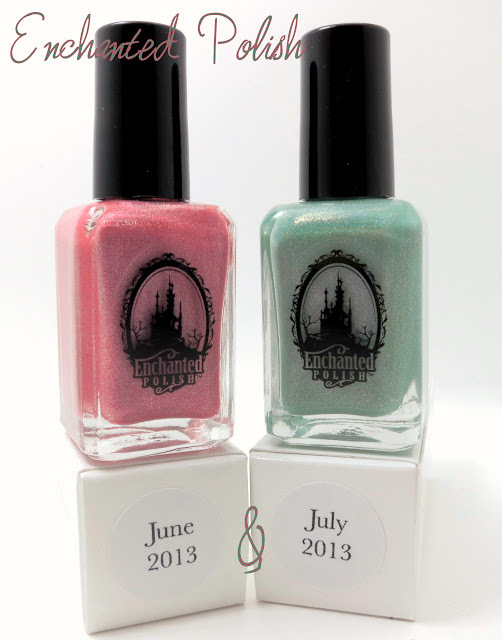 July 2013 is a jade green holo with pink shimmer. Shown is 2 coats with top coat. Unfortunately these colors were limited edition and may not be brought back in the future. You can still find other colors for sale, when a restock comes along ;), through EnchantedPolish.com, Mei Mei's Signatures and Norway Nails. Follow Enchanted Polish on Facebook, Twitter and Instagram or sign up for her newsletter, for information on restocks and new colors.